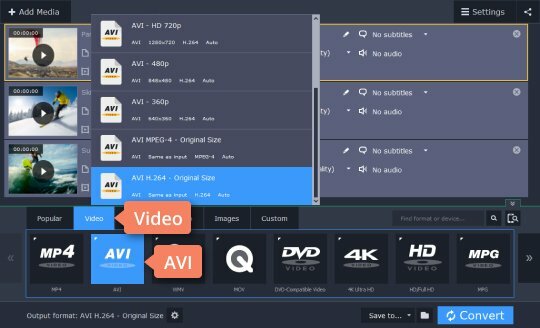 Now you can quickly rip your DVDs using Movavi Video Converter. 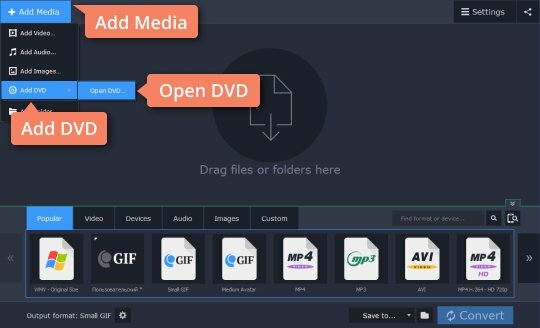 Just follow the instructions in this tutorial and you'll be able to rip DVDs to any video format you like: AVI, MOV, MKV, M2TS, and many others! With our handy DVD ripping software, it's a one-click task to convert a DVD to the MP4 file format to watch it on your mobile phone. No need to understand video formats, settings, or technicalities – just run the software, open your DVD, select a ready-made preset and click Convert. To learn how to rip a DVD, just download Movavi Video Converter for PC or Mac and read the tutorial below. Download Movavi Video Converter – a convenient DVD ripper. After the download is finished, run the setup file to install the program. Launch Video Converter. Click the Add Media button, then select Add DVD > Open DVD, and find the VIDEO_TS folder on your DVD. In the Video or Devices tab at the bottom of the video converter interface, select the video format or mobile device you need as your target. You can choose from over 180 media formats and 200 device presets. Click the Folder icon next to the Save to field to specify the folder on your hard drive where the program should save the converted files. Finally, click the Convert button. The program will start processing your media files. If you want to copy your videos to a mobile device after the converting process is complete, minimize or close the program, turn on your mobile device and connect it to your computer. Start the uploading service or just copy and paste the output file to the target folder. And that’s all! Note that uploading process might take some time depending on the size of your video file. So now you know how to easily rip DVDs using Movavi Video Converter! Disclaimer: Please be aware that Movavi Video Converter does not allow you to convert copy-protected media files and DVDs.